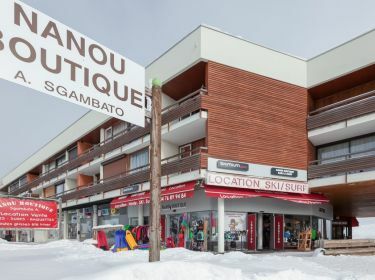 CHAMROUSSE 1750 Ski Rental - NANOU BOUTIQUE Ski Hire : book your ski and snowboard equipment online ! You will have the best prices : up to 50% off on your equipment. All year long our friendly and dynamic team receive you warmly in a breath-taking environment, a foot away from the ski slopes at Chamrousse 1750. Rental, shopping, repairs and more! You’ll be happy to find high quality material adapted to your needs. Ski, snowboards, snowshoes, snow scoots… From beginners to experts, our professional team advise you and gear you up properly. For those with their own equipment, our technicians offer repairs, edge tuning, waxing and will get you material as good as new. Want to shop ? We’ll take care of you as well! 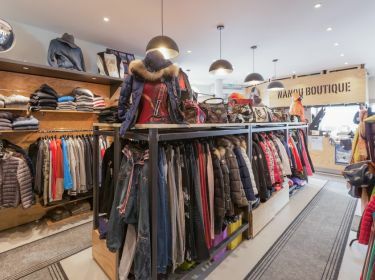 Sportswear, prêt a porter, technical gears, when it comes to dress up, Nanou boutique has it all. If you book on our website, you can get up to a 50% discount on ski and snowboard gears rental. See you soon in CHAMROUSSE 1750. Don’t bother carrying all yours and your children’s ski equipment, we offer storage service in the shop right in front of the slopes. Nanou Boutique is located in the Commercial Centre in front of the main parking. You can park right in front of the shop. For more comfort, we offer to deliver your equipment at your place (subject to charges).